Last month EA described Battlefield 3 as "superior" to Activision's all-conquering franchise in every way. In response, Activision Publishing boss Eric Hirshberg accused EA of talking about Call of Duty: Modern Warfare 3 more than it should. "I think EA might talk about our games in the press more than we do," he said. "So, the first thing I say to them is, 'Thanks for the assistance in building awareness.'" But EA has told Eurogamer the competition between Battlefield and Call of Duty is good for the industry – and for gamers. "Everybody loves a heavyweight fight," EA Games Label boss Frank Gibeau told Eurogamer at E3 this week. "All the fanfare and pomp and circumstance that goes into it is good for customers and good for the industry. "It brings a lot of new attentions to things. It forces innovation in terms of the category. It gets customers to choose. "So from our perspective, we're at our best in these types of situations and we enjoy them, perversely. We're having a bit of fun with it. "Over the years I've worked on the sports business, too, with FIFA versus PES. It helps keep the business and industry vibrant and driving forward as opposed to getting stale and, 'Boy, there haven't been any good movies out this summer,' type situations. The competition is great for innovation." Earlier this year, Riccitiello claimed EA and Activision would spend a combined total of around $200 million on marketing their respective shooters. 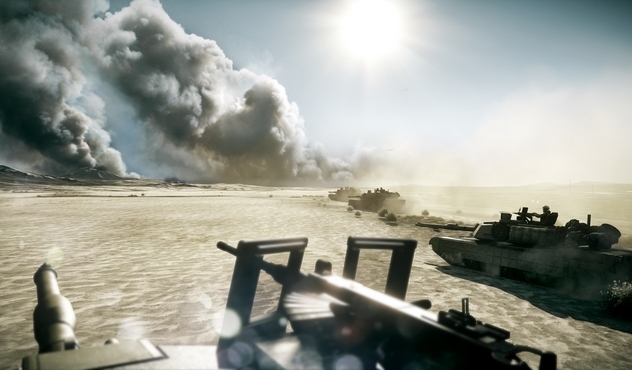 Battlefield 3 goes first, in October. Modern Warfare 3, which many analysts expect to be the fastest-selling game of all time, follows in November.